Brad and I went skiing with some good friends last weekend. We spent all day Saturday with snow flakes falling on our faces and, at least in my case, saying prayers of thanks that I didn't break a leg as a result of my very limited experience on skis. When the day was over, all I wanted to do was sip on a cocktail while cooking a warm, soothing soup in my cozy kitchen. There is something about ending an active day cooking something delicious that can't be beat. One of the things I love about cooking is that you can make seemingly small changes that make a recipe new and fresh. Adding coconut milk to what would otherwise be a classic butternut squash soup, for example. That's the fun part- taking something classic and making it your own. Classic cocktails are another perfect place to add little touches that reflect the seasons or showcase your favorite garnishes and ingredients. Another perk of going with the classics is that you can learn a lot about mixing good drinks. 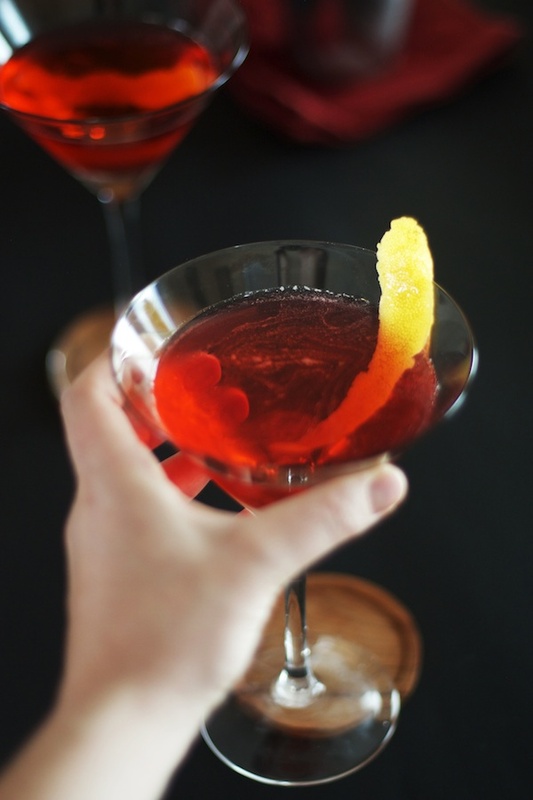 The Negroni, for example, demonstrates how delicious Campari can be when the bitter flavor is balanced properly. Gin and vermouth are used to both highlight the bitterness and mellow it out. The finishing touch, typically a twist of orange, completes the cocktail with a bright citrus scent that you catch just as your mouth touches the rim of the glass but before the liquid passes through your lips. Perfection. The only change I made here is the garnish. Rather than going with the traditional orange twist I opted for Meyer lemon. Consider this my trademark when it comes to the classic Negroni. At some point this weekend I will be sipping on one of these and hopefully cooking up something delicious. Cheers, friends! Combine the campari, gin and vermouth in a cocktail shaker filled with ice. Cover and shake vigorously for about 15 seconds. Strain into a chilled cocktail glass and garnish with the strip of zest.